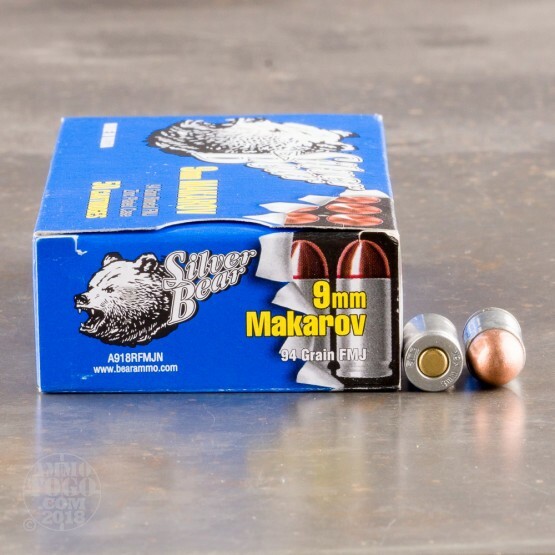 Silver Bear ammunition derives its name from its highly polished zinc-plated steel casings. Designed to prevent corrosion and extend shelf-life, zinc-plated steel offers all the characteristics of nickel-plated brass at a fraction of the cost. In addition, t is the perfect option for long-term storage. Manufactured at the Barnaul Machine Plant in Russia (best known for producing high-quality loads for the Russian military), Silver Bear ammo offers a great balance of performance and affordability. 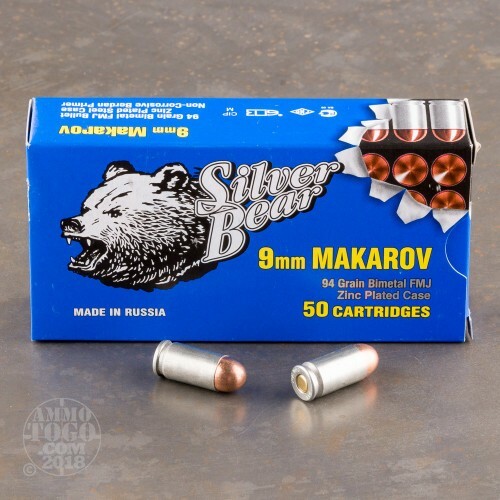 This package contains 50 rounds of Silver Bear 9x18 Makarov ammunition. Each round is loaded with a 94 grain full metal jacket (FMJ) projectile. 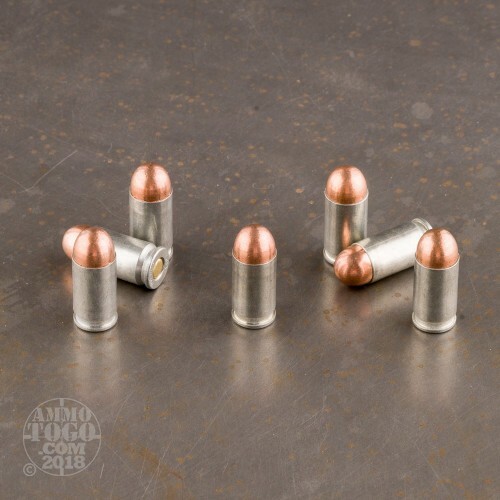 Delivering minimal terminal expansion, these rounds are best suited for target shooting, tactical drills, and casual plinking. This factory new ammunition is 100 percent non-corrosive, Berdan primed, and magnetic. Each round produces a consistent muzzle velocity of 1013 feet per second. MY CZ-82 LOVES THIS AMMO FOR SUPPER! HAD NO JAMS OR MISFIRES WHATEVER THROUGH 400 ROUNDS. THE AMMO WILL GIVE YOU A CLEANING JOB TO DO BUT MY CZ-82 SHOT ACCURATE TO THE VERY LAST BULLET AND I MEAN ACCURATE. THERE IS LITTLE RECOIL WITH THIS BULLET AND SPARKS COME OUT, BUT THIS IS SOME FINE AMMO AND IT AIN'T REAL LOUD AS IN BANG! BUT MORE LIKE A BIG POP POP. YEAH , I GOT OTHER CALIBERS OF HANDGUNS INCLUDING 9MM LUGER BUT I'LL TAKE A 9MM MAKAROV OVER A 380 PLUS 9MM MAKAROV IS FUN TO SHOOT AND THE BULLETS DON'T COST EVEN A FINGER. 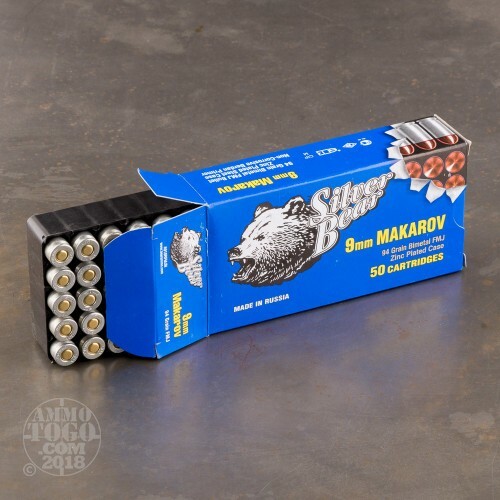 As a Mak owner, I have to say you cannot go wrong with Silver Bear & Brown Bear 9x18. They're economical, accurate and are an excellent product. OUTSTANDING! Accurate with no failures. Will purchase more in the future.